MISO (Mixture-of-Isoforms) is a probabilistic framework that quantitates the expression level of alternatively spliced genes from RNA-Seq data, and identifies differentially regulated isoforms or exons across samples. 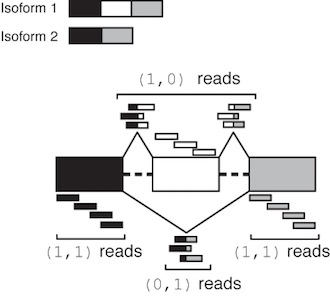 By modeling the generative process by which reads are produced from isoforms in RNA-Seq, the MISO model uses Bayesian inference to compute the probability that a read originated from a particular isoform. The MISO framework is described in Katz et. al., Analysis and design of RNA sequencing experiments for identifying isoform regulation. Nature Methods (2010). MISO treats the expression level of a set of isoforms as a random variable and estimates a distribution over the values of this variable. The estimation algorithm is based on sampling, and falls in the family of techniques known as Markov Chain Monte Carlo (“MCMC”). For details of the inference procedure, see Katz et. al. (2010). Mailing list where users can ask technical questions is available at miso-users (http://mailman.mit.edu/mailman/listinfo/miso-users). The primary version of MISO is called fastmiso – which is written in a combination of Python and the C programming language. To install MISO, either download one of the stable releases (see Releases) or install the latest version from our GitHub repository. See below for detailed installation instructions. MISO is available as a Python package, listed as misopy in pypi (Python Package Index). numpy and scipy. Note: MISO requires numpy version > 1.5! We strongly recommend that you install MISO using a Python package manager (see Installing the fastmiso version of MISO) so that the required Python modules are automatically installed and managed for you. where SE.gff3 is a GFF file containing descriptions of isoforms/alternative splicing events to be quantitated (e.g. skipped exons). Parse and filter significant events with sufficient coverage. For a full example of running MISO, see Example MISO pipeline. Also see the Frequently Asked Questions (FAQ) page. See MISO glossary for quick explanations of MISO terminology. There are two options for installing MISO, using either a stable release or installing the latest version from GitHub. Use --help argument to view options. If you get no errors, the installation completed successfully. Note that MISO also needs samtools to be installed and available on your path. This will create a directory called MISO, containing the repository. Alternatively, if you do not want to go through git, you can download a zip file containing the latest MISO GitHub release (following this link: https://github.com/yarden/MISO/zipball/fastmiso). This zip file has to be unzipped (e.g. using unzip fastmiso on Unix systems) and contains the latest release of the MISO repository. Next, compile the code and install MISO using the Python package manager (such as as pip or `easy_install`_) as described above. We strongly recommend that you manage Python packages using a package manager rather than manually installing packages and modifying your PYTHONPATH, which is error prone and time consuming. It is crucial that the samtools command is available from the default path environment, or else MISO will not be able to parse SAM/BAM files. On a Unix or a Mac OS X system, you should be able to type samtools at the prompt and get access to the program without specifying any path prefix. You should be able to import both of these packages without errors from the Python interpreter. The misopy package is the main MISO package, containing utilities for analyzing RNA-Seq data and plotting it (including sashimi_plot). The pysplicing package is an under-the-hood interface between Python and the statistical inference engine written in C.
If you see errors prior to this, the most likely cause is that some dependency is not installed or not available in the path environment. For example, if samtools is installed but missing from the path (i.e. not accessible from the shell), that will cause errors in the test run. To run MISO, a set of annotations (typically specified in GFF format) of the isoforms of alternative events must be provided and RNA-Seq reads (typically specified in SAM format). The GFF annotation is indexed into an efficient representation using a script provided by MISO. The SAM reads must be sorted and indexed into the BAM format (binary version of SAM) before they can be used with MISO. The sections that follow describe in detail the file formats used for the annotation and for the reads and the specific steps that are required to run MISO. An example of a MISO pipeline for computing isoform expression estimates and detecting differentially expressed isoforms is given in Example MISO pipeline. The figure below shows an overview of how to run MISO. Exon-centric analyses are recommended for looking at alternative splicing at the level of individual splicing events, e.g. the inclusion levels of a particular skipped exon, or the use of a particular alternative splice site. In isoform-centric analyses the expression level of whole isoforms for genes are estimated (i.e. the expression of each individual isoform of a gene is estimated). Both of these analysis modes have merits and disadvantages. Exon-centric analyses are typically easier to interpret and validate experimentally, but do not always capture the complexity of a set related splicing events within a gene. Isoform-centric analyses capture more of this complexity, but are limited by the typically short length of RNA-Seq reads, and inaccuracies or incompleteness in the annotation of the gene’s isoforms. Estimates of isoform-level expression are also harder to validate in the lab using traditional techniques such as RT-PCR. To run MISO, an annotation of the alternative splicing events or isoforms must be provided and a set of reads. Single or paired-end reads can be provided in the Spliced Alignment/Map (SAM) format (in its binary form, BAM) and the annotation can be in the GFF (version 3) format. The GFF format can be used to specify either whole mRNA isoforms of genes (which is the common use of the format) or to specify single alternative splicing events, as described in Alternative event annotations. When run locally and not on a cluster, MISO will use multiple cores on the machine on which it is running. The number of cores/processors to be used by MISO is set through the settings file (see Visualizing RNA-Seq reads along isoforms with MISO estimates). It is highly recommended to run MISO on a cluster when possible. Since each gene/exon can be treated as an independent inference problem, MISO is highly parallelizable, and the use of multiple computers can cut run times down by orders of magnitude. MISO comes with basic functionality for running on a cluster, assuming that there’s a shared filesystem between all the nodes. These annotations can be downloaded from the MISO annotations page. For performing isoform-centric analyses, any gene models annotation can be used (e.g. from Ensembl, UCSC or RefSeq) as long as it is specified in the GFF3 format. As an example, we provide GFF3 annotations from Ensembl (which were converted from Ensembl’s GTF format to GFF3), available in Human/mouse gene models for isoform-centric analyses. A recent paper from Bin Tian’s group, Analysis of alternative cleavage and polyadenylation by 3′ region extraction and deep sequencing, annotated alternative cleavage and polyadenylation events in mouse tissues using the 3′READS method. The annotated events (TandemUTR and ALE) are available in GFF format on the MISO annotations page, courtesy of the Tian group. The ID of the exon was chosen arbitrarily to be chr1:4775654:4775821:-@chr1:4774032:4774186:-@chr1:4772649:4772814:-. This name encodes the genomic coordinates of the upstream (5’) exon, the skipped exon, and the downstream (3’) exon of this alternative splicing event, separated by @ symbols. The two isoforms that result (encoded as mRNA entries in the file) are: (1) the isoform made up of the upstream exon, the skipped exon and the downstream exon (isoform where the exon is included), (2) the isoform made up of the upstream exon followed by the downstream exon (isoform where the exon is skipped.) Note that we only use the two flanking exons in this annotation, but one could modify the annotation to include arbitrarily many flanking exons from the transcripts. We chose to name the two mRNA entries as the coordinates of the exons that make up the mRNA followed by A for the first isoform, B for the second, though these naming conventions are arbitrary and do not have to be used. Similarly, the ID of each exon is encoded as its coordinate followed by up, se or dn to denote the upstream, skipped or downstream exons, respectively. A mapping from alternative events to genes can be downloaded from the MISO annotations page. Note that in the above GFF annotations for events, only immediately flanking exons to an alternative event are considered. For example, for a skipped exon event, only the two exons that flank it are considered in the annotation. In the human/mouse genomes, this means that the two isoforms produced the event would be roughly ~400 nt and ~300 nt long. Modified annotations that use more of the exons present in the two isoforms might be more appropriate for use with long insert length paired-end libraries where the average insert is significantly longer than these isoform lengths. This in general will not affect isoform-centric analyses, where the entire mRNA transcript is used as the annotation to quantitate. For isoform-centric analyses, annotations of gene models are needed, where whole mRNA isoforms are specified for each gene. Any annotation that is in GFF3 format can be used, e.g. annotations obtained from RefSeq, Ensembl, UCSC or other databases. Download your gene annotation (e.g. Ensembl genes, RefSeq) from UCSC Table Browser. For example, an Ensembl genes table ensGene.txt can be downloaded for the mm9 genome from UCSC goldenPath here (http://hgdownload.cse.ucsc.edu/goldenPath/mm9/database/ensGene.txt.gz). To convert this gene table into GFF3, use of these two ways: (a) use the script ucsc_table2gff3.pl (from biotoolbox) to convert the table directly into GFF3, or (b) use the UCSC utility genePredToGtf to convert the table into GTF format (instructions for this are described in http://genomewiki.ucsc.edu/index.php/Genes_in_gtf_or_gff_format) and then convert the GTF file into GFF3 using gtf2gff3.pl. It is critical to note that Ensembl and UCSC have distinct chromosome naming conventions (see warning note below). However, Ensembl tables obtained from the UCSC Table Browser will follow the UCSC chromosome naming conventions, not Ensembl’s, which is why the UCSC-downloaded Ensembl annotations in the GFFs provided above contain chr headers. Ensembl annotations obtained directly from Ensembl (e.g. via Ensembl BioMart) will of course follow the Ensembl chromosome naming conventions, and not UCSC’s. For convenience, we also provide GFF3 annotations of gene models from Ensembl (release 65), which were simply converted from Ensembl’s GTF to GFF3 format and are otherwise identical to the Ensembl annotation. The path of the Python version on the system used to install MISO will automatically be invoked when running these scripts. If you installed MISO using setup.py --prefix=~/ in your home directory or some other path, these scripts will typically be placed in a designated executables directory in your home directory, e.g. ~/bin/. 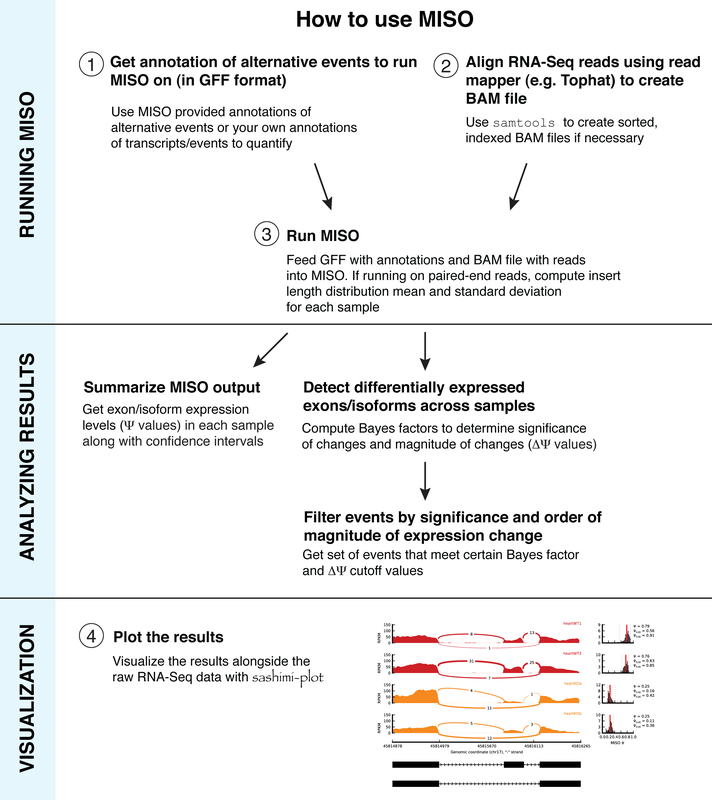 MISO can take as input RNA-Seq reads in the SAM format. SAM files are typically the output of read alignment programs, such as Bowtie or Tophat. The SAM format can represent both single and paired-end reads. Files in SAM format must be converted to an indexed, sorted BAM file that contain headers. If you have an indexed, sorted BAM file you can move on to the next section. The mm9_complete.fa.fai is a header file that contains the lengths of each chromosome in the genome used to create the my_sample.sam file. The .fai files can be created from the FASTA files of a genome using the faidx option of samtools (e.g. samtools faidx genome.fasta). The sam_to_bam script will output a set of BAM files and their indices (my_sample.bam, my_sample.sorted.bam, my_sample.sorted.bam.bai) to my_sample/. To quantitate alternative splicing, an annotation file must be provided that describes the isoforms whose expression should be estimated from data. For exon-centric analyses, a GFF file can be used as well, except such a file will contain only the subsets of the isoforms produced by a particular splicing event – rather than whole transcripts – as described in GFF-based alternative events format. The GFF file chosen has to be indexed for efficient representation. A set of indexed, ready-to-use events is available for the mouse and human genomes. This will index the GFF file SE.mm9.gff and output the result to the indexed/ directory. This indexed directory is then used as input to MISO. min_event_reads: What the minimum number of reads that a region must have for it to be quantitated. The minimum number of reads is computed over the longest genomic region of the gene or alternatively spliced event. strand (optional): What the strand convention of the input BAM files is. Can be set to either fr-unstranded, fr-firststrand, or fr-secondstrand. Set to fr-unstranded by default. See Note on strand-specificity in RNA-Seq libraries for an explanation of these strand conventions. cluster_command: the name of the program used to submit jobs to the cluster (e.g. qsub, bsub, etc.) MISO will use this command to launch jobs on the cluster system. long_queue_name (optional): the name of the “long queue” (jobs that take longer to finish) of the cluster queueing system. short_queue_name (optional): the name of the “short queue” (jobs that generally finish quicker and might get priority) of the cluster queueing system. The name of this queue is often short or quick depending on the way the cluster is configured. Both long_queue_name and short_queue_name can be omitted from the configuration file, in which case jobs will be submitted to the cluster without specifying any queue. All parameters set in the [clusters] section are only relevant when MISO is used on a cluster. burn_in: the number of initial sampling iterations to be discarded before computing estimates. lag: the number of sampling iterations to skip when computing estimates. A lag of 10 would mean every 10th iteration is used. num_iters: the total number of sampling iterations to be computed per gene/event. num_processors (optional): Number of processors to use when running locally using multiple cores. Set to 4 by default. Not used when running on a cluster. The default settings of the sampling-related parameters in [sampler] was deliberately chosen to be conservative. To run MISO to estimate the expression level of a set of annotated isoforms or events in GFF format, the miso script is used with the --run option. This produces distributions over “Psi” values (Ψ), which stand for “Percent Spliced In”. See Katz et. al. (2010) for a description of these values and how they are computed. Compute Psi values for given GFF annotation. BAM file (with headers) to run on. This will compute expression values for the isoforms described in the indexed GFF directory mm9/pickled/SE, based on the reads in data/my_sample.sorted.bam (a sorted, indexed BAM file) an output the results to the my_sample_output/ directory. Note that the mm9/pickled/SE directory in this case must be generated by the user, by running index_gff. The --read-len option is necessary and specifies the length of the reads in the data (in this case, 35 nt.) The directory mm9/pickled/SE, which is available in the mouse splicing event annotations, specifies an indexed version of all the skipped exon (SE) events. Note that that the headers for the indexed/sorted BAM file (the files with the .bam.bai extension) must be in the same directory as the read BAM file. In the above example, it means they must be in the data/ directory. Length of overhang constraints imposed on junctions. deviation of insert length distribution. The insert length distribution gives the range of sizes of fragments sequenced in the paired-end RNA-Seq run. This is used to assign reads to isoforms probabilistically. The insert length distribution can be computed by aligning read pairs to long, constitutive exons (like 3’ UTRs) and measuring the distance between the read mates. The mean and standard deviation of this distribution would then be given as arguments to --paired-end. For example, to run on a paired-end sample where the mean insert length is 250 and the standard deviation is 15, we would use: --paired-end 250 15 when calling miso (in addition to the --run option). The --overhang-len option is not supported for paired-end reads. We provide a set of utilities for computing and plotting the insert length distribution in paired-end RNA-Seq samples. The insert length distribution of a sample is computed by aligning the read pairs to long constitutive exons and then measuring the insert length of each pair. The set of insert lengths obtained this way form a distribution, and summary statistics of this distribution – like its mean and standard deviation – are used by MISO to assign read pairs to isoforms. The utilities in exon_utils and pe_utils can be used to first get a set of long constitituve exons to map read pairs to, and second compute the insert length distribution and its statistics. This will output a GFF file (named Mus_musculus.NCBIM37.65.min_1000.const_exons.gff) into the exons directory containing only constitutive exons that are at least 1000 bases long. This file can be used to compute the insert length distribution of all mouse RNA-Seq datasets. Exons here are defined as constitutive only if they occur in all annotated transcripts of a gene. Computing the insert length distribution given a constitutive exons file: Now that we have a file containing the long constitutive exons, we can compute the insert length for any BAM file using the pe_utils utilities. The option --compute-insert-len takes a BAM file with the RNA-Seq sample and a GFF file containing the long constitutive exons. The insert length is defined simply as the distance between the start coordinate of the first mate in the read pair and the end coordinate of the second mate in the read pair. This will efficiently map the BAM reads to the exons in the GFF file using bedtools, and use the result to compute the insert lengths. The command requires the latest version of bedtools to be installed, where the tagBam utility was added the ability to output the interval that each read maps to in its BAM output file. The reads that aligned to these exons will be kept in a directory called bam2gff_Mus_musculus.NCBIM37.65.min_1000.const_exons.gff/ in the insert-dist directory. This will generate an insert length distribution file (ending in .insert_len) that is tab-delimited with two columns, the first specifying the exon that the read pairs were aligned to, and the second specifying a comma-separated list of insert lengths obtained from aligning the read pairs to that exon. The number of entries in the file corresponds to the number of exons from the original GFF that were used in computing the insert length distribution. This indicates that the mean of the insert length distribution was 129, the standard deviation was 12.1, dispersion was 1.1, and the number of read pairs used to estimate the distribution and compute these values was 862,148. Intuitively, the dispersion constant d corresponds to how variable the insert length distribution is about its mean. The lower the d value is, the tighter/more precise the insert length distribution is in the RNA-Seq sample. The dispersion constant and an interpretation of its values is discussed in the MISO paper (see Analysis and design of RNA sequencing experiments for identifying isoform regulation). The insert length distribution can be plotted using the .insert_len file using sashimi_plot. To compute the insert length by simple pairing of read mates by their ID (assuming that mates belonging to a pair have the same read ID in the BAM), explicitly ignoring the relevant BAM fields specifying whether or not the reads are properly paired, use the --no-bam-filter option. The option --compute-insert-len can take a comma-separated list of BAM filenames in case you want to compute the insert length for multiple samples in one command. The --compute-insert-len option of pe_utils by default uses only exons from the GFF file that are 500 bases or longer. This can be tweaked by passing pe_utils the optional --min-exon-size N argument, which will only use exons of size N or longer. In our example, we used a constitutive exons GFF file that contained only exons that are 100 bp or longer, so the default settings will consider all exons in that file. --chunk-jobs N (optional): places N many genes or events into each job. For example, if running MISO on a set of skipped exons, --chunk-jobs 200 will place roughly 200 exons whose expression is to be estimated into each job. If each job was sent to a separate node, it would mean every node in parallel will sequentially compute the expression level of 200 exons. The value of --chunk-jobs depends on both cluster size/availability and on the number of exons whose expression is to be estimated. On very large clusters where nodes are generally available, a relatively small setting of --chunk-jobs is likely to be more efficient. --no-wait (optional): by default, the main process that submits the jobs to the cluster will wait for them to finish. If --no-wait is passed, the main process will not wait, and simply quit after submitting the jobs. MISO will use the cluster submission and queue settings described in the settings file to submit jobs (see Visualizing RNA-Seq reads along isoforms with MISO estimates). An example of a MISO pipeline for computing isoform expression estimates and detecting differentially expressed isoforms is given in Example MISO pipeline. --SGEarray: Run jobs on Sun Grid Engine. To be used in conjunction with --use-cluster. --job-name: Name the job submitted to Sun Grid Engine system. Thanks to Michael Lovci for this feature. When running MISO, through miso --run, the raw output will be a set of posterior distributions over Ψ values. Each exon or gene, depending on whether the analysis is exon or isoform-centric, will have its own file containing posterior samples from the distribution over Ψ. Most users will never need to access these raw distributions and can simply summarize this raw output as described in Summarizing MISO output, or perform a comparison between a set of samples as described in Detecting differentially expressed isoforms. The header line (beginning with #) gives information about the gene/event in the file, like the names of the isoforms in the annotation and the length of the exons, as well as values of internal MISO parameters (like burn-in or lag, described in Visualizing RNA-Seq reads along isoforms with MISO estimates). The first column (sampled_psi) lists the Ψ value sampled and the second column (log_score) gives the log score of that sample under the MISO model. The Ψ value is comma-separated and will have as many entries as there are isoforms. In the above file, there are two isoforms, and so two entries in the Ψ column that sum to 1.
a directory to output summary file to. This will create a subdirectory summary_output/summary/ with a file my_sample_output.miso_summary that summarizes all the events in the sample in my_sample_output/. ci_high: the high bound of the 95% confidence interval on the Ψ estimate. assigned_counts: inferred assignment of reads to isoforms. Lists each isoform (0-based) and the number of reads assigned to it. For example, for an alternative event with two isoforms, the entry might be: 0:330,1:34, indicating that 330 reads were assigned to the first isoform (isoform 0) and 34 reads were assigned to the second isoform (isoform 1). When one of those fields is not available (e.g. strand), NA is outputted in its place. Note that miso_posterior_mean is an estimate of Ψ and [ci_low, ci_high] are the 95% confidence limits of that estimate. Once MISO output has been computed for two samples or more, pairwise comparison of differential isoform expression can be computed. To test if an isoform or exon is differentially expressed between between samples, the Bayes factor is computed for the exon, which represents the weight of the evidence in the data in favor of differential expression versus not. For example, a Bayes factor of 2 would mean that the isoform/exon is two times more likely to be differentially expressed than not. The computation of Bayes factors is described in detail in Katz et. al. (2010). This would compare the MISO output in control/ to knowndown/, and output the result to the directory comparisons/control_vs_knockdown. Note that “vs” is used to denote sample comparisons. The output format of this comparison is described below. If MISO is run on an annotation that specifies more than two isoforms per event/gene, then the fields for the Ψ estimates become comma-separated and give the estimates for each isoform. For example, in the case of three isoforms, sample1_ci_low would be a comma-separated list of the lower bounds of the first, second and third isoform, and sample1_ci_high would be a comma-separated list of the upper bounds of the first, second and third isoform, and similarly for the fields involving the other sample. Starting from version 0.5.0, the miso_pack utility is available for packing raw MISO output. The packing utility converts the raw MISO output directories that contain *.miso files and converts them into a portable SQLite database (one database file per chromosome.) This reduces the number of files substantially, which otherwise could burden the filesystem. The packing operation uses the built-in SQL library of Python (sqlite3) and does not require installation of any external SQL databases. The miso_pack utility will traverse the entire directory structure of miso_output and pack any directories that contain raw MISO output. Note: The SQLite databases made by miso_pack can be read independently of Python and queries as ordinary SQLite databases. However, end-users should never need to deal with these files directly. Once all the samples have been summarized and all pairwise comparisons between samples have been made (as described in Summarizing MISO output and Detecting differentially expressed isoforms), space can be saved by archiving the MISO output for long-term storage. This compression reduces the number of files dramatically, since each sample gets one SQLite database per chromosome. The resulting directory structure is then compressed further using standard zip compression into a single zip file (in this case named mydata.zip). This will uncompress mydata.misozip and output its contents into the directory uncompressed/. Note: miso_zip will not delete the directory being compressed. The directory can be deleted manually after compression is done. Below is an example of a MISO pipeline, where Ψ values for a set of alternative events are computed (with confidence intervals) for a pair of samples called “control” and “knockdown”. A samples comparison is performed to detect differentially expressed isoforms between the samples. ## Detect differentially expressed isoforms between "control" and "knockdown"
Once MISO runs are completed and pairwise comparisons between your samples have been made to compute Bayes factors (using --compare-samples), the resulting files can be interpreted to detect differential events. For each pairwise comparison, we will have a .miso_bf file which contains the Ψ values of each event in both samples along with confidence intervals (assuming the event is detectable in both), the Δ Ψ values, the Bayes factor, and other useful information about the read counts used to compute these values. MISO comes with several utilities (such as filter_events, described in Filtering differentially expressed events) for helping with the interpretation and analysis of these output files. This section serves as a brief guide the MISO output files, the utilities for analyzing them, and to various caveats in interpreting the output. A first-pass filter for detecting differentially changing events can apply a Bayes factor cutoff along with a Δ Ψ cutoff, using the bayes_factor and diff fields of the samples comparison output file. Section Filtering differentially expressed events describes a utility that will apply these filters for exon-centric analyses. It is critical to note that the default MISO settings were intentionally set to be highly inclusive, and therefore do not impose any stringent coverage criteria on the events for which Ψ values and Bayes factors are computed. By default, MISO requires only 20 reads to be present in the locus/event of interest. For many events, only a tiny fraction of these reads might be in informative regions – like junctions or regions unique to one of the isoforms – and so the expression levels of these events might not be reliably estimated. It is important to use the information provided by MISO about the raw number of read counts used in estimating the expression levels of each event/gene. The class (0,0) denotes reads that were incompatible with either isoform, either because they didn’t match these isoforms or were otherwise unusable (e.g. they were part of a read-pair where one end was unmappable, in the case of paired-end reads.) Reads in this class are not used by MISO – they are only reported to indicate that they were discarded. Events that meet the very minimal default coverage criteria do not necessarily have sufficient read support to be considered alternatively spliced in your RNA-Seq samples. In practice, events that might not be alternatively spliced in the samples of interest meet the default minimal read coverage criteria, although their read class counts imply that they are not reliable estimates. Such a case might be an alternative exon in the input annotation to MISO that has, for example, 19 reads in the exon upstream of the skipped exon, and 1 read in the exon downstream of the skipped exon. This event would have a counts signature of: (1,1):20,(1,0):0,(0,1):0. The (1,0) and (0,1) reads, which are most informative about the relative inclusion levels of the exon, are both 0, so unless these are non-zero in other samples in the dataset, the estimate of the inclusion levels of this exon will not be reliable. For this reason, coverage filters must be imposed by the user when post-processing MISO output. An example of such a filter is given below for exon-centric analyses. in at least one of the RNA-Seq samples processed by MISO, where X, Y are the number of reads in the (1,0) and (0,1) read classes, respectively, and N is an arbitrary but sizeable number (e.g. 10 or 20). This filter requires that the sum of inclusion and exclusion-supporting reads be greater than or equal to N, and that the read class supporting exclusion is non-zero in at least one of the samples. This guarantees that at least some of the reads are informative about the inclusive or exclusive isoform. Note that this filter does not guarantee that there will be junction evidence for the inclusion isoform, but does guarantee that there will be a junction evidence for skipping of the exon. To increase power to detect differential events, coverage filters should be applied in aggregate across all RNA-Seq samples that were processed by MISO. To detect switch-like exons that are fully included in one sample and fully excluded in another, we should require the number of exon exclusion supporting reads be non-zero in at least one of the samples – or summed across samples – rather than in every sample. This filter can be easily applied by parsing the counts field in the samples comparison (.miso_bf) file produced by MISO for each pairwise comparison. For isoform-centric analyses where the number of read classes is considerably larger, MISO will output the counts in the same format. For a gene with 3 isoforms, we can have the read classes (1,0,0),(0,1,0),(0,0,1),...,(1,1,1) and other filters can be applied, depending on the goal of the analysis, to select genes that have sufficient coverage to be reliably estimated. Important information is contained in the confidence intervals outputted by MISO for each estimate of Ψ. The width of the interval corresponds to our confidence in the estimate of the Ψ value, and so the larger the confidence width is, the less reliable the estimate. As expected, the width of the confidence interval will depend on the number of informative reads, such as reads crossing junctions or reads in regions that uniquely identify the isoform. 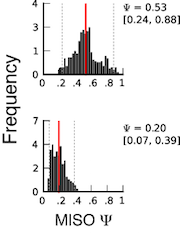 The figure on the right shows two posterior distributions over Ψ for the same alternative splicing event in two samples, where the exon had low coverage (i.e. small number of reads) in both. The posterior distribution is plotted as a black histogram, whose mean is indicated by the red vertical line and 95% confidence intervals shown by dotted grey vertical lines. The actual Ψ values and the confidence interval bounds are given to the right of the distribution. In the top distribution, the confidence interval width is .64 (since .88 - .24 = .64) which is extremely wide. The distribution’s probable range spans from 20 to nearly 90%, far too broad to be useful. In the bottom distribution, the confidence intervals are narrower, though still considerable. Because of the large amount of uncertainty in the top distribution, we cannot confidently conclude that the true Ψ value is likely to be different between the two. Although the difference of means between the distributions is large (.53 - .2 = .33), the confidence intervals overlap considerably as a result of the uncertainty in the top distribution. In practice, requiring no overlap at all between the confidence intervals of two samples is too restrictive, but the width of each estimate’s confidence interval and the relationship between the intervals should be kept in mind when interpreting the results. --num-total N: Number of total reads aligning to any isoform (or to both isoforms) has to be greater than or equal to N.
--num-inc N: Number of inclusion reads (i.e. reads supporting the first isoform) has to be greater than or equal to N.
--num-exc N: Number of exclusion reads (i.e. reads supporting the second isoform) has to be greater than or equal to N.
--num-sum-inc-exc N: The sum of inclusion and exclusion reads has to be greater than or equal to N.
--delta-psi P: The absolute Δ Ψ value must be greater than or equal to P (where P is in [0, 1]). --bayes-factor N: The Bayes factor must be greater than or equal to N.
--apply-both: By default, the above filters on read coverage of the isoforms are required to be true in only one of the samples. To consider only events where the filters apply in both samples, use this option. This will output a filtered Bayes factor file, filtered/control.miso_bf.filtered that contains only events meeting the above criteria. MISO comes with a built-in utility, sashimi_plot, for visualizing its output and for plotting raw RNA-Seq read densities along exons and junctions. Thu, July 20: Released 0.5.4. Fixes indexing bug in credible intervals computation (see issues issue_98 and issue_103). Tue, March 10: Released 0.5.3, which fixes a bug in processing stranded reads. Thanks to Renee Sears. MISO license updated: it is licensed under GPL 2, not BSD, since it depends on GPL 2 code. We apologize for the confusion. Added support for Travis CI. Tue, Mar 11: Released 0.5.2, which fixes an error reporting bug. Thanks to John Tobias and Sabine Dietmann. Sun, Feb 23: Fixed Sashimi plot bug. Fri, Feb 21: Fixed critical bug in miso_pack handling of Ensembl chromosomes in 0.5.0 release. Please update your release. Thu, Feb 20: Released 0.5.0. Renamed scripts: The core MISO scripts are now named miso, summarize_miso and compare_miso. Python extensions (.py) have been dropped. Entry points are used in Python installations to resolve issues with scripts not being registered as executables after installation. Jun 26: Fixed formatting error for version 1 ALE events. Reorganized documentation. Apr 26: Released version 0.4.9. Contains Sashimi plot-related bug fixes. Fixed bug in --prefilter option. Added -p option to run_events_analysis.py for determining the number of processors to be used. Fixed potential deadlock situation when running locally on machines with multiple cores. Added miso_zip utility for compressing/uncompressing MISO output. Better error checking for incompatibilities between BAM and GFF files, e.g. cases where the chromosome naming conventions between the annotation and the BAM differ. Fixed entries in hg19 alternative event annotations where start > end. Changed default MISO settings file to omit queue names from cluster submissions. See also all release updates (including older releases). MISO is passed a BAM file that is not sorted and indexed. BAM files must be sorted and indexed to allow MISO random access to regions in the BAM. MISO was passed the wrong read length: for example, the reads in your BAM file are of length 50 but you passed a different read length in the --read-len argument. MISO requires the correct read length to be passed. How can I map MISO alternative event annotations to the genes they are in? An easy way to do this is to get the transcription start and end sites for all genes, and overlap these with the MISO alternative event coordinates. We provide our own mapping (based on Ensembl gene models) of alternative events to Ensembl gene IDs for the human and mouse annotations, available here Mapping of alternative events to genes. To create your own mapping of events to genes based on a different annotation, all that is needed is a table containing the transcription start/end sites for all genes. These can be be downloaded from the UCSC Genome Browser (by clicking the “Tables” tab), or from Ensembl’s BioMart. In UCSC tables, the transcription start/end sites are encoded in the fields txStart or txEnd. You can overlap the coordinates of the events given in our GFF3 fields to these start and end sites in your favorite gene model annotation (e.g. UCSC, Ensembl, or Refseq) and determine what gene they overlap. What is the license for MISO? MISO is licensed under the GPL v2 license (updated March, 2015). Rather than estimating the expression level of a single alternatively spliced exon (“exon-centric”), or of each transcript belonging to a gene (“isoform-centric”), one can quantify the levels of multiple isoforms produced by several nearby alternative splicing events. This is called local multi-isoform quantitation. These isoforms can be encoded in the GFF format as for the case of alternative splicing events that produce two isoforms, described in GFF-based alternative events format. The original Python version of MISO was written by Yarden Katz. The C version of MISO was written by Gábor Csárdi, with Python interfaces written by Yarden Katz and an R interface written by Gábor Csárdi. Parts of the code for visualizing MISO estimates was written by Eric T. Wang. The MISO manual was written by Yarden Katz. The Python-only version of MISO is now deprecated – we recommend using fastmiso. Katz Y, Wang ET, Airoldi EM, Burge CB. (2010). Analysis and design of RNA sequencing experiments for identifying isoform regulation. Nature Methods 7, 1009-1015. IGV: Visualizer of mapped reads (e.g. BAM files). Displays junction reads. Airoldi, E.M. (2007). Getting started in probabilistic graphical models. PLoS Computational Biology, 3, e252. A Practical Course in Bayesian Graphical Modeling by Michael Lee and Eric-Jan Wagenmakers: Free online book that contains (among many other things) excellent chapters on Bayesian hypothesis testing with practical examples, including discussion of Bayes factors and the Savage-Dickey ratio test. Griffiths, T. L., & Yuille, A. (2006). A primer on probabilistic inference. Trends in Cognitive Sciences, 10. © Copyright 2010, Yarden Katz, Gábor Csárdi, Eric T. Wang, Edoardo M. Airoldi, Christopher B. Burge. Revision 1ca049fa.